It never fails. When I sell a Janome embroidery machine, the customer always comes back and says they can’t get their designs to their machine with their USB stick or CF card. Is something wrong with the USB stick or CF card? Is something wrong with the machine? No and no are always the answers to these questions. The real problem is that the customer is not placing the design files into the correct folder on the USB stick or CF card. I can’t blame them for not knowing this, because the owner’s manuals don’t make it very clear. Unless the designs are placed into the right folder, the machine will not see that they are there, and you won’t be able to use them. This tutorial is going to show you how to get your designs into the right folder on your USB stick or CF card. The designs will then be recognized by your embroidery machine, and you will spend more time embroidering and less time wondering what is wrong. First, before doing anything else, stick your USB stick or CF card into your embroidery machine, then turn on the machine. By doing this, your machine will create a necessary folder system on the stick/card, into which you will place your designs. Normally you will see a message on the screen of your machine that tells you not to take the USB stick or CF card out for a little while. Once this message goes away, turn off the embroidery machine, and remove the card/stick. Now plug your USB stick into your computer, or insert your CF card into the CF card reader of your computer. We now want to open a new window and navigate through the computer to find the USB stick or CF card. I would normally access the stick/card through “My Computer”, but you may also use Windows Explorer. If you are lost at this point, you may require a lesson or two in basic computer usage, but this is beyond the scope of this blog post. When you have successfully navigated to the USB stick or CF card on your computer, you will notice the folders that your embroidery machine made. The destination folder for your designs is shown in fig.1. For example, if you have an MC11000 or MC11000SE, you will be looking for an folder named EMBF that is inside a folder named EMB. Once you have the destination folder open, minimize that window by clicking the _ button in the upper right corner of the window. We will come back to it later. Open up another window, and this time navigate through your computer to find the designs you want to transfer. Sometimes the designs are on CDs, and sometimes the designs are downloaded from the internet. You will need to find your designs by navigating through your computer. I can’t tell you where they are, because you were the one that put them there. I use Windows Explorer to browse through my computer, but you may also access your designs through “My Computer”. Once you have found the location of your designs, typically files with a .jef file extension, proceed to the next step. Copy the design(s) you want to put on your stick/card by right clicking on them and clicking “copy”. To select more than one design to copy at a time, just hold down the CTRL key on your keyboard and click multiple designs. With all the designs highlighted, right click on any part of the highlighted area and click “copy”. Next, maximize the window of your destination folder, right click inside it, and click “paste”. You will now see the design(s) you wanted to transfer in the destination window. You can now pull the USB stick/CF card out of your computer, and insert it into your embroidery machine for stitch out. Your machine will recognize that the designs exist, because you put it in the right folder! If you have followed my instructions, you should be ready to embroider. I have read your explanation and I am so pleased that you have written this for Janome users. It is the most common question that I have come across in the Janome Forum. I would suggest that you emphasize that the .jef files need to be placed in that second folder (embf on the MC11000) as this seems to be the biggest problem folks have. Thank you for posting this in your blog. Hallo i have just purchased my Janome 350e and again I am trying to transfer designs from my pc to my machine. I have followed your instructions by turning off the machine and putting my usb memory stick into the machine but when i turn it on and click on the memory stick button it just says please insert the usb memory stick or connect the cd-rom drive. I made some changes. Hopefully these changes will further clarify the basic process of getting a design to a Janome machine. You mentioned .jef files in your comment, and I assumed people would know what type of embroidery files they can use. I guess I shouldn't assume anything, but for anyone that has read these comments for more information, it should be noted that all of the machines listed in this blog post accept .jef files. Other embroidery formats will not be recognized or usable by these machines. I have been downloading .jef files for my Memory Craft 350 Janome for some time, and I had them in small flash drives. Because I fell and had to sit in a wheelchair for some time, I reorganized my files into categories and got a bigger flash drive to hold them all. I have them in about six folders on my computer. Now my question; how do I make more than 1 of my designs? I have one design working but cant get any more. I am elderly and I have to be told. Thank you so much if you can help me. Are you asking how you can combine designs, and how to sew more than one design at the same time on the Janome 350E? I followed your instructions to a tee, but when I put the USB stick into my machine, the pattern comes up gray not colored. What did I do wrong? As long as you are able to get the design to your machine, then you followed my instructions correctly. I'm not sure about the problem with your designs coming up gray, but it sounds like you may have corrupt design files. Thank you. I am not sure if they are to be colored on the screen, as none of the built in designs are colored. I followed your instructions and managed to transfer the designs to the USB stick which worked that day, but today I am trying to use them again, and I'm having problems. The machine keeps saying, "USB error". What is happening? Hi Heather. It sounds like your USB stick may have died. Have you tried another USB stick? I have a Digitizer Jr. Question, because I am having a problem copying the wording to a USB stick. If I try and use the copy and paste, it will not copy and paste to any folder on my computer, and not even to the USB stick. When I am finished I hit Edit, and then high light the wording. The copy and paste comes up, but when I go to the USB stick it will not show the paste open. Does this program run with Windows XP or do you need Vista? Karen, based on your questions and history of comments on this post, I think you need to go to your local dealer for a lesson. Although the purpose of this blog post is to help a reader send an embroidery design to their machine, I can't fully and adequately train you how to use Digitizer Jr, and honestly don't understand this last question. I'm sorry I can't be much help in this instance. I'm having a major problem transferring data from DigitizerPro to my MC11000. The EMB folder and EMBf folders are in place however the MC11000 only sees an ORD and ORDf folder. Any ideas how to fix this? I've formatted the USB on the computer prior to trying it. I've formatted on the 11000 prior to trying it. I've copied the *.jef files into every folder prior to trying it. I've made choice comments about the machines ancestry and still no success! ANY suggestions would be a stress reliever! If you're only seeing ORD files, then you might not be in embroidery mode. ORD files are sewing files, and EMB files are embroidery files. Make sure you are in embroidery mode. A million thank you's. I have a MC11000 that I have been ready to throw out the window. Your post helped me figure out where exactly my embf file went. I have spent so many countless hours reloading, buying new flash drives, and voila you had the answer. Oh thank you, thank you, thank you. I can't believe it was that simple, when the process of putting the designs on my USB finally worked with your fantastic instructions, I could'nt believe my eyes when the designs were there on my machine ready to use on my MC11000. I wish that Janome would put your simple and easy to understand explanations on both their website and manuals. Also another thing I just realized and it was not obvious to a new Embroidery machine owner like me, is the designs are only visible when your machine is actually set up in Emboidery Mode, not Ordinary Sewing Mode. thanks again for taking the iniative to write this blog. I've been using files from several commercial embroidery file companies, without any trouble until recently. I have one folder on the USB key that, when I select it, crashes the sewing machine! Any idea why this would be occurring? Hi Ricki. Storage devices, especially flash storage devices, are prone to corruption. It's just the nature of the digital beast. Always remember that storage devices fail, and that you should backup your data/designs and store the backups in a separate location. We use FTP and save files to a webserver at MDD Hosting. For ongoing work on my websites, I use code repositories at Bitbucket. You ought to try a different storage device, and think about throwing away the one that is giving you problems. Are these instructions to be used on the MC 9500? I am trying to get simple instructions in plain English (not too good with computer lingo). I have all this Janome equipment just sitting here. My local store closed their doors last fall, just when i was getting into machine embroidery. I need very basic, 1,2,3 instructions in order to move my patterns from computer to my machine. I had started with the re-writeable cards but that was expensive. i would like to know what brand,size and card reader to purchase for my Janome MC 9500. Any first grader info is welcome. I do not have a lap top, just a desktop computer. Thank you. I'm a newbie to embroidery machines. Just purchased a Janome 350E yesterday, and it should be here in a week to 10 days. I'm sooo excited, can't wait. For the last 2 days, I've been reading posts on several forums. Think I know how to get started with the USB flash drive. I know I have to put it in emb. machine to format. I just downloaded 2 free emb. designs to pc. When I'm ready to copy to USB, do I transfer the file as .jef zipped or unzipped file. I have unzipped it on my pc, and the file format changed to .pdf. Make sure it is unzipped! Hi Anne, If you purchase an USB card reader that reads CF type cards, you will be able to do what you need to do. If you go to newegg.com and search for "card readers" you will see some options. I have a 10001 & Digitizer MB3. I just purchased a Singer 350 Futura and when I put the start up embroidery CD in my computer, it crashed my Digitizer program. Can I put both on the same computer or do I have to use 2 laptops? Any help is greatly appreciated. I have no experience with the Singer embroidery software, and would recommend you contact your local Singer dealer. Since there is a software conflict, you could try installing the Singer software first, and then install the Janome software. If changing the order of installation does not help, then I'm afraid you will have to use two separate computers. Also, the best person to contact in a situation like this is a dealer who sells both Singer and Janome, since they may have experienced this issue before. Thank you for the above info have followed to the letter on the 350E but still getting a message on the machine: Memory error reformat? I reformat and start over again move the design to the USB put in the machine and the same message appears just going in a loop. This is a brand new USB any help would be appreciated. I want to say "THANK YOU" from the bottom of my heart!!!! 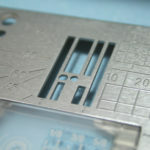 I have been struggling for days trying to get the Janome MC 11000 to recognize the designs I had put onto my USB stick. Hooray! Your post has finally help make that a reality! I am truly grateful! I couldn't decide if I needed to buy another software program or not. Hooray! I don't have to buy another! Hi, I have the Memory Craft 200E and have followed these instructions to the T and it will still not work. I get my design downloaded onto a USB stick, insert into the machine, it shows the embf file but no file with a design. Why am I unable to get this to work? I am using a mac, does that make a difference? It shouldn't matter if you are on a Mac or Windows computer, the location where you need to put the designs is the same. If you are local, you're welcome to come by the shop sometime and I'll show you how it works. If you're not local, find your local Janome dealer, and I'm sure they'd be glad to help. Sometimes it's easier just to show a person than try to describe how it works. I am so glad to hear I am not the only one having this problem with their machine. The place I ordered my machine even tried talking us through and it wouldn't work. So they had me send the machine back and after a month I finially got it back. Now to try it. If I would have known it was going to be this difficult I would have never gotten it. Will jef format designs that are already put on a usb stick be easy to use on my Janome 11,000 Special Edition? I'm buying a usb stick with designs already on it. Will I need to ask the seller any questions? Please help. Thank you. Ms Jones, there's no way to know if the designs were put in the correct folder on the USB stick, so they may or may not work. You'll have to wait and see. Make sure to ask the dealer who is selling you the machine to show you how to use your USB stick. If you don't understand the directions in this blog post, there probably won't be anything I can do for you. Is there a stitch limit for designs on the Janome 11000SE? I have tried to load large design files (42,000 stitches), and the machine will not read them. I have reduced the size of these designs in Wilcom software to just fit within the 8 x 8 hoop (a reduction to about 88% of the original size), but cannot load either the original or the resized design. Any tips? Thanks in advance! Susan, I've never heard of a maximum stitch count limitation for the 11000SE, and 42,000 doesn't seem like an excessive amount of stitches. If you send me the design in an email, I'd be glad to see if I can open it. You'd have to call me for my email address, because I don't post it online. (951) 694-9576. I bought my embroidery machine, the Janome Memory Craft 12000, and I have problems transferring designs from my USB stick. I've been in and read what others have written about the problem. I have also done exactly as it says that you should do to make it work. It seems that not machine just cannot read the files, not even the files that I send from Digitizer MBX. Weird, eh? Susanne, I think you need to bring your machine to your dealer and have them show you what you are doing wrong. If you are not doing something wrong, then make them fix it! 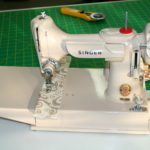 If they can't fix it, I think you should go to another dealer, or bring your machine by Temecula Valley Sewing Center. We haven't experienced any problems with the 12000, but since you have a warranty, you should make sure everything is working. That's the whole point of having a warranty. Are these instructions to be used on the MC 9500? I am trniyg to get simple instructions in plain English (not too good with computer lingo). I have all this Janome equipment just sitting here. My local store closed their doors last fall, just when i was getting into machine embroidery. I need very basic, 1,2,3 instructions in order to move my patterns from computer to my machine. I had started with the re-writeable cards but that was expensive. i would like to know what brand,size and card reader to purchase for my Janome MC 9500. Any first grader info is welcome. I do not have a lap top, just a desktop computer. Thank you. Thank-you, Thank-you, Thank-you...There is no information in the instruction book for Janome MB-4 telling you that you have to put the usb stick into the machine first. I nearly had my hair pulled out, wondering why it was not working. Thank you very much for all your help. I have an 11000 and MBX version 4 and for some strange reason I cannot get my letter design "Guelph, ON" that are digitized then transferred from my computer to the machine. Last week I had other letters "Royal City Squares" using Olde English font, and it copied to the machine fine. Each of these designs require three (3) hoopings and transfers from the computer to the 11000. What could be wrong? I have a laptop XP SP3 and the MBX manual says XP is fine. Thinking there was not enough memory in the 11000, I deleted some older files. This did not help. It would copy a small portion then clang [a sound] and says "failed to send a design"
I have a Janome 350E and 4D Suite software. Apparently I also have an unusual problem. I can transfer designs from my computer to the 350E however I'm unable to transfer text. Both files were created in 4D, both saved as .jef to the same folder. I can see both of the files on my flash in E:EmbF5MyDesign. The graphic file appears on the 350E screen however the text file does not. After almost a week of trying different scenarios, I'm stumped. Do you have any suggestions? Thank you for your blog. Oh My Goodness...Thank you so much for posting this tutorial!!! I just got this great Jenome 9700 and have spent HOURS trying to figure out what I'm doing wrong, formatting and re-formatting the compact flash card, going from one computer to the other...feeling really defeated...only to find your tutorial and discover I was not placing designs in the pre-programmed folder! God Bless You for posting this...and really, Janome, do you think you could make this info easier to find!??? I want to know why is that my card quits working in my machine. I have transferred several designs to my reader cards and used them and then they quit working, when I put them in my embroidery machine the warning sign comes up and does not go away. Now I was putting a new card with some designs on it into my machine and it says insert update card. What is going on with this. Hi Lisa. It sounds like you may have a problem with your machine. Since this has happened with more than one card, you should probably bring the machine to your local dealer and have them replace the main circuit board. I have followed your instructions. when I put my usb into my machine I have my designs folder but when I click on it to open there is nothing there. What am I doing wrong? If you've followed my instructions, then you'll probably need to visit your local Janome dealer. 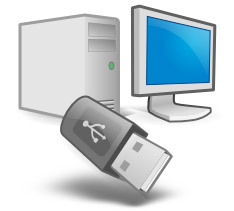 There could be a problem with your USB stick, your camera card, or perhaps even your machine. Sorry I can't be of more help. I am using a new USB that is 8GB. My directory is set up correctly and I can see the designs on my MC350E screen. But, when I select the file, I get the "Short of memory space. The file cannot be saved." message. This is not for all of the files on the USB. However, I did see one statement by a Janome 350E User that the machines did not like larger than 2GB. Could THis possibly be the cause of this problem? Thank you. I am in Tucson away from my dealer in Houston, Texas. Very grateful for any help on this. Yes, absolutely. You should try to find really small USB sticks, as anything over 1GB is a waste, unless you have hundreds of thousands of designs. My wife wants information on how to use a USB stick with her new Janomie MC 5700, she does not use the computer so I had to do it, I am not a sewer but I found your site helpful and even interesting, I think that I can help her now. I saved it to my favorites for future reference to help my wife. Help!!!! My machine takes a CF card but I don't know where to put it on my laptop to download my files, .ie I don't seem to have anywhere for the CF to go , hope you understand. I have been trying to do this for DAYS; back and neck killing me. It finally makes sense. The one thing I wasn't sure of is, when putting the stick back into the Janome 11000 will the same messages come up not to remove the stick until the warning message goes away? If so will it erase my files? I really can't thank you enough for help. Well, I guess it did delete everything nothing is coming up...ugh! Will try again until I get it. Janet from Florida. I have a Janome MC10000 and have been successfully dowloading and transferring designs. In the last couple of years the change fron windows XP to Vista and now Windows 7 means the PC connection lead no longer works. I have been using a card adapter with my Windows 7 machine but lately have had designs that will not function properly. The sequence order of thread colors does not follow in order, and if you try to select a section either nothing happens or it hops to another section. Some of the icons go pale and will not let you select them. I have taken it for repair and when I rang today they say there is nothing wrong with it but I think they have only stitched out a built in design. Any ideas? I am unsure the sewing repair shop know what they are looking for. Can the .jef files be grouped in subfolders in EMBF (MC11000) or must they reside there directly? I hope that makes sense. Thanks. As far as I know they must be located directly inside the EMBF folder, and not in a sub-folder. I have Memory craft 9700. I am using a mac computer, which seems to be the problem. I have a card reader. When I put into the sewing machine it say communication error. I dont feel like the card reader is doing anything when I plug it into the computer. I can see the patterns I want to transfer. What am I doing wrong? remember it is a Mac computer. I have the Embrillance downloaded also. Nothing has helped. Hi Deb, If your Mac isn't recognizing your card reader, you can probably go to the card reader's manufacturer's website and download current drivers. I don't know how this works on a Mac, but that is how I'd do it on Windows. If you can't find compatible drivers, you might need to buy a card reader that works with the Mac. You shouldn't have problems after that. First of all, I would like to say thank you, thank you, thank you. I have talked to a local software store as well as the Janome tech support (I have a MC350E), and you are the first person that has walked me through it. I, too, have a Mac, and thought it was the problem, but I just didn't know to look for the file name EMBF5 (I have several other things on my USB, and I also didn't know I was supposed to stick it in my machine first. I have not downloaded any software, but I did download a free trial of the stitch buddy AP last night. I can't say that there is much change other than being able to see the thumbnail pictures, but I haven't spent much time tying to figure it out. All that to say, I followed your directions with a MAC and I was able to find the folder. Thanks again. O.k. I must be really blank in my head. I'm pretty good with a computer, but I've tried and tried to download designs onto a USB stick and nothing happens. I put the stick in my machine and....nothing. I have a Janome memory craft 350. I am so completely frustrated I want to return the machine. I followed these directions to the letter. First off, when I put the USB in my machine to begin with, I just sit there. Nothing comes up on the screen. OMG someone please help before I go crazy!!!!! Hi, I would like to transfer my flower collection 251211000/1010 from the PC Card (PCMCIA) to my computer. can you help me? Mary, all you need to do is stick the card in your PC's card reader. You then have access to copy and paste the files anywhere on your computer that you like. I don't have a card reader to accommadate that type of card. What do you suggest? Hi I have a 300E and find that when I do my own designs onto the card and try to sew onto the machine itself it jumps around and brakes the thread. Does anyone know a way of stopping it happen. Thank you for this info, because it's no where in the manuel. I have the Memory Craft 200 E. Can't figure out why Jamone doesn't put this info into their maneuls or CD's sure would save a lot of aggravation for the users. Thank you again. I couldn't agree with you more. The owners manual is missing many, many bits of information. I have the Memory Craft 200E. I purchased a file from a seller on Etsy for a font in 6 different sizes, both upper and lower case. The files says it contains 312 items but when I put the memory stick into my machine it only recognizes 100 items in 25 pages with 4 items on ea. page. Is there a limit on file size? Does anyone know. Got this machine for Christmas and am new to embroidery machines. Been sewing for over 40 years but this is all new to me. Helen, it sounds like you may need some hands-on instruction from us or your local dealer. I really don't know how to explain this more clearly. Thank you so much. This could have taken me a long time and a lot of frustration to work out on my own. I'm overwhelmed by what I have been reading. Read the entire users manual, 5 different user groups of info and would be thrilled if someone who has a Janome 9500 sewing/embroidery machine could tell me what brand/size CF card they have and what brand of reader they use. I know I need one of each but which one? There are millions on the web...some as inexpensive as $20 (my idea of a good deal!) all the way up to over $100. Not my idea of a good deal. Woo hoo! It worked!!! Thanks for your clear directions. Does anyone know how to get the stitch count off of a Janome MB4? I purchased some software from a local retailer for my Janome 200e. Apparently my computer can not read jef files. When I search for a program to open the files all the rusults are for me to buy scanning software. I am working on a Windows 7 format. Any suggestions? Open the EMB file then open the EMBF file you have a blank field then this is where you put the files and it worked yipee, but I never would have done without this post. The janome only works well on a 2 gb card, any larger and it overloads, I do not remember where I read this, but my 8 gb is a definite no go, my 2 gb works fine after I formatted it. I installed the horizon link software on my computer but when I come to plug the machine to my computer via the usb cable, windows cannot find the driver for it. Then nothing works... I even tried it with my laptop and still have the same problem. I just bought a Janome 120000. I have an embroidery baby CD that i put in my computer. It has 4 parts and I am able to see 3 of the 4 on my computer, the 4th however is the design folder. When I click on it all I get is the designs that came on my Janome. Help!!!! ... and of course they are not coming across to the Janome. Thanks so much for these instructions! It worked perfectly for my Janome MC350E. Ann, sorry I can't be of any help but I too own a Janome 5000. It's a lovely machine, but like you say it is frustrating not to be able to found out any answers. Someone mentioned a universal card reader that read the .SEW format that the 5000 uses but I can't seem to find any further information out. If I get anywhere, I'll post a reply. I've read all of this but I'm still not clear how to transfer patterns from my MacBook, to USB stick, then to my JANOME 11000SE. Would like step by step instructions. 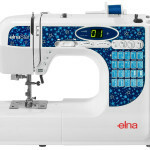 Hi, I am trying to transfer jef designs to my janome 300 E by way of my pc and using the Customizer 10E which I understand must fix in there somewhere. Your site makes it all a little clearer, but I still can't get anything to show up on my janome 300E after I enter it. It shows up on the computer. I Can you please walk me through step by step with the Customizer 10 K. I am new at this. I wrdered some fonts and designs on line and they came to my email. They came in several formats and I pulled the jef out and put them in a folder on my desktop and cd. Is that considered a sub folder that I am not suppose to use? Thanks so much for any help. I have purchased a used MB4 and have no dealer close. I need some serious hands on instruction. When I call the dealers over 1 hour away they tell me if I had bought my machine from them they could help me. I'm willing to pay for some hands on. I live in central Alabama and am desperate to get help. Any ideas? I just updated my MC11000 to an SE today. I could see the designs and stitch them no problem before the update. Now I can't find them or the EMBF folder. When I checked, they were still on the stick and came up on my computer. What can I do? 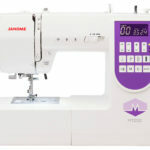 I've just purchased a used Janome 350E and wondered if you can rename designs from the numeric name to something that you'll recognize, or will the machine only recognize the original naming convention? I have downloaded a few free ones to try out, and renamed them the object they are - eg instead of design G807 I've renamed it Butterfly. I had already formatted a very small usb stick and the designs are in the correct folder but when I try to access them on the machine by clicking the mydesigns folder, it just locks up and sits there. Could that be the problem? I've never heard of the name causing a problem. What happens if you change the name back to what it was? Everything is working now, thanks. I reformatted the USB stick and started over, and you're right the name didn't matter. I've stitched a few out and they are fine! I've been doing some reading on the internet about fonts for the 350E and I understand if you buy a font program, you can't stitch more than one letter out unless you have some sort of software to edit, am I correct? One response suggested you could open each "file" which would be each letter, and move them around as though you were combining any design? Seems like a bit of work, but might do it until I can afford a software program. You're right about the fonts. You'll never be able to buy a font package that works like the ones that are built in to the machine. As far as I know, that goes for any brand/model machine. Software is really your only option. Thank you for a wonderful clear explanation for transferring designs from my computer to my brand new Janome. I am thrilled!! How do I get larger letters? I need larger letters for my daughter's shirts, dresses, etc. 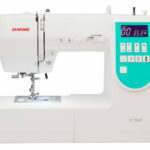 I have a Janome 300e or 350e. I changed the % to 120 and the letters are still small. Help please and thank you! Just wondering how I can make the letters bigger on the 350E? I have used the large letters then enlarged it up to 120% but that seems to be as big as I can go.. I have a Janome MB4. I have found your site to be invaluable. Like many, I was having issues transferring files from the computer to the machine. Thanks to you, that is no longer a problem. Once the files are on the pen-drive and the machine is reading them, I find it takes a long time to go through to the one I want to use since the machine reads about 8 files at a time. Let's say, for example, I have a few hundred designs! Is there a way to go directly to all the designs starting with the letter "M" or "J"? On the machine I see an option of creating a "new" folder. Is this what I should be using? How do I do that? I have tried.... in vain! The best thing to do is store your designs permanently on your computer or CD, and use the USB pen-drive (aka USB stick or thumb drive) to transfer designs to the machine. You won't have problems with lag if you only have a couple of designs. You might also try using a smaller capacity storage device. I believe the machine is only capable of browsing/using 64MB, so if you are using a 2, 4, 8, or 16+ GB storage device, the machine requires extra time to catalog the contents, even if it is empty. Thanks for this useful info. I am also trying to sort out the following issue; I have purchased some fonts and I cannot figure out how to embroider complete words (as opposed to letter-by-letter). I can do this with the built-in fonts but not with the ones I bought. Please help! Without software there is no way for you to use a purchased alphabet in the same way you use your machine's built-in alphabets. I have a Digitizer MB. Is that the software you mean? I have not tried it yet. Yes, although not the same as using the lettering of the embroidery machine, the software will do wonderful things for you. It is very kind of you to furnish this information. I have had a Janome 300e for almost 7 years, and it stitches beautifully. I do know to put the designs in the emb5 folder; however, some designs are read in the machine perfectly while others are rejected as damaged files for no apparent reason. They are seen on my computer and on my CF cards but not on the 300e. I have struggled with this for perhaps the past 3 years and had had no help. It is extremely frustrating. Do you or anyone else have any suggestions? Sherri, before doing anything, try another card. It does sounds to me like you have a circuit board issue. Especially if you are within your 5 year circuit board and electronic parts warranty, you will want to make sure to have your Janome dealer look at the 300e. Hopefully it's just the card. Thank you for your response. I do appreciate it. I have 15 CF cards, and it makes no difference which one I use. Some designs simply won't be read by my 300e while others on the same card are just fine. Also, I have 4 friends who purchased their 350e's because they saw how lovely my 300e stitched, and they all have the same problem, only this time it is their usb flash drive -- exactly the same problem. I am so hoping to find a solution. That is strange. Would these designs happen to be really large, or is there anything special or different about them? I'd really like to do some troubleshooting with your designs. If you will zip them up and send them to me, I'd be glad to find out what is going on. I might even pass them on to Janome if I can't figure it out. I'll send you an email, and you can respond with the zip if you like. Thanks to you I can now use downloaded patterns on my usb stick. Some I do have to work on, but that's probably just me. LOL, thanks again and keep up the good work! THANK YOU so much for this clear straightforward explanation of how to upload files to the Janome machine. It was very helpful; its just a shame the manufacturer does not feel that they need to put this information in the instruction booklet! I have a Memory Craft 9000 and would to know if there is a way to hook it up to my laptop which doesn't have a 9 pin plug. I need to know how to change the com. port to a usb drive so I can get rid of my old computer. I bought a 9 pin plug to 15 pin plug which my laptop has but don't see any way to change the com port. I also tried a nine pin plug to a usb port. Please tell me how to do this if there is any way to make it work. Also I would like to know if I can buy a card so I won't have to run everything thru the scan and sew pc to get it into the embroidery machine. Ruby, I might be wrong, but I don't think the connection on the 9000 was meant to allow you to interface with your computer. On many machines this plug is meant to allow for plugging in a card reader that lets you use embroidery cards of an older format. Connie, if this blog post doesn't have enough information for you, I'd suggest coming by the shop sometime, or visiting your local Janome dealer for some help. You probably don't need that card reader, and the file transfer is usually something that can be done in less than a minute. Riza, it sounds like you need to bring your machine in for a repair. I can't really say more without seeing the machine. Hi I bought the memory craft 350e a while ago and love it although some of the designs I have bought are too big for the A & B Hoops that come with the machine - so my question is can I buy the GIGA hoop and use it (i dont want to split designs or buy the customiser if i dont have to etc) or am I just unable to do them?? You can download a free version of Wilcom Truesizer and it can resize your embroidery patterns, plus change the file to your embroidery file', which is a 'jef' so eg. if the pattern is a 'hus' you can change it to a 'jef'. Hope this helps. Check the size of your flash drive it seems that matters. My mom was using a 2GB and she continued to have problems locating the EMBF folder. Once she switched to a smaller flash drive (64MB) everything worked perfectly. Hope this info helps someone else! OMG!!! Thank you soooo much for sharing this information. I have been searching for HOURS how to get this $*%! machine to read my USB stick. Thank you! Thank you! I have a Janome 9000. I just replaced my computer and my Scansoft software is not compatible with the computer. What software can I use of how do I get my designs to my machine? 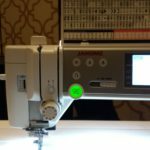 Patti, the Scansoft software pre-dates my experience with Janome sewing machines, as we have only been a dealer for about 8 years. That said, I would suggest checking the Janome website for software updates, but I don't believe you will find one due to the age of the machine. I think you should investigate running a virtual machine, which allows you to run one operating system inside another. As long as you have an O/S disc for the operating system that the software was designed to run on, this is probably the only solution that will work for you. Sorry if this sounds a little too advanced, but it is. Consult your local computer geek, as this type of software installation is out of the scope of this blog. I'm just about ready to shoot myself for several weeks now my machine Janome 11000 with upgrade has been driving me to distraction. and then despair kicks in again as I see some of the files are showing and some aren't, so I start from scratch download, save, switch on and still some are not there. I do however get a white box with the file name in red, and if I click on it I'm told the file is either missing or damaged. Ive contacted the embroidery download companies I have used and the files are all complete when downloaded. I really don't know what to do now. 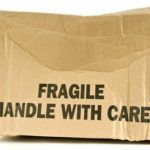 I was overjoyed to read your blog, and know that I have been transferring on to the card correctly. I thought I was but you begin to doubt yourself so wanted to check it out, and this is how I came across you. please if you have the smallest bit of information that could possibly help me with my problem, I would give anything to hear from you. Kerry, I would suggest bringing the machine and designs to the dealer where you purchased the upgrade from. They can help you figure out the problem, and a dealer can usually show you what you were doing wrong quite easily. Other than that, you might try re-naming the files to something short with only alpha characters. I don't really know of anything else you could try, but if you'd like to meet with me here at the shop, I'm normally here in the afternoons. Take care, Brian. I have a 9700 and I have downloaded some design files to a 64mb CF card. Some of the designs are from a CD and some downloaded from a website. I followed your instructions for formatting the card and transferring from my Mac. I thought I was successful because they showed up on the screen when I selected the PC Card icon on my machine's screen. Alas, the machine won't actually sew them. I've gotten a message when I first call the files up that asks if I want to delete damaged or corrupted files. I click OK, but it doesn't seem to make a difference. Any ideas? Maree, you should bring the machine to your local dealer and have them check the embroidery unit. It's not very common, but some machines have a problem where the belt attachment point for the Y axis is loose, and the stitch-out is as you have described. It's an easy fix for your dealer. Just purchased a 350e and trying to transfer text designed in 4d extra embroidery, the designed text file shows up on the stick when it is in the computer, however it does not show on the sewing machine, images like picture embroideries are transferring just fine, what's going on? I have combined, resized and saved as a .jef before saving to the USB stick. HELP! I have just purchased Janome 10001, just want to know if I use 32 bit PC card (USB 2.0 +IEEE 1394) instead of using CF card, will it work in this machine as it has no direct usb option. Kareem, I can't give you advice other than it's worth a shot. See if it works, and if it doesn't then you'll need to find some CF cards. HI, I have the Janome 350E as well, and I am having trouble trying to figure out how to get my downloaded fonts (ex:Disney letters) onto my machine as a font. Right now I have to sew the letters individually instead of a whole name. I have the Monogram Wizard Plus program, but I haven't figured out if I can get the fonts on there either. Please help!!! I had to sell my commercial machine and then had regrets so I bought a small home Janome 200E. I have managed to get the designs on the USB to the machine. But the machine says the design is too big. My design is under 4X4. And I'm using the 5x5.5 hoop. Any suggestions??? I'm about to throw this machine out the door!!! How many stitches are there in the design? It could be a stitch count issue. Try reducing the stitch count if possible. Ready to give up after two days!!!! I have downloaded embroidery fonts, extracted to card, copied to card....Done everything I have been told but when I insert my card into the Memory craft 9700 I get an hour glass and then a blank screen that say ATA PC Card at the top. That is all. Help....please! Listen everyone, it's clear based on the comments that you were either extremely happy with the blog post, or you continue to have problems. I'm going to close comments for this blog post because by reading (and possibly re-reading) the blog post, and by reading all of the comments, you should have a good understanding of how to get a design to your embroidery machine. If you're still having problems, please visit your local Janome dealer.